If you define the workflow to execute as the owner of the workflow than the workflow can potentially perform actions the user does not have permission to – e.g. create certain records, or delete a record. The workflow will have the permissions of the Owner of the workflow rule which you can set higher than the permissions of the end users. 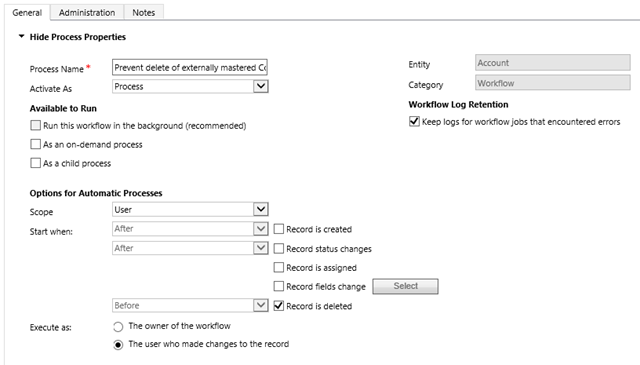 If you define the workflow to execute in the context of the user then any records created or updated will reflect the user as the CreatedBy / ModifiedBy. I’ve had scenarios in the past where I have needed to perform a validation when a user attempts to update or delete a record. If the record in question has certain properties I would need to reject the user action. 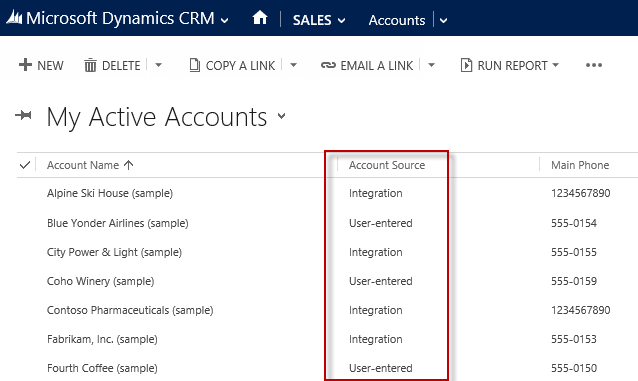 A common example is where you have external data that is synchronized with CRM and you need to prevent updates to those synchronized records, but not other records that are user-created – and these records reside in the same entity. 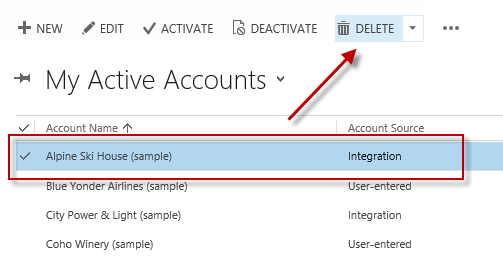 My users should be able to delete Accounts that are flagged as “User-entered” but not those flagged as “Integration”. I can’t achieve this via the CRM Security Model as it does not support data-based access rules. I need to grant my users delete permissions and then overwrite their delete attempts when I need to block that action. I can do this with a Workflow process. 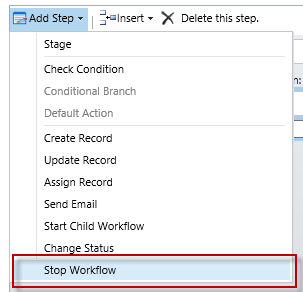 But with workflows not able to run synchronously we can use this feature to block the user action that triggered the Workflow in the first place. We need to stop the Workflow as Canceled in this scenario as that will block the delete from completing. You can embed fields from the record or from related records just like you can when you are using workflow to create a record. In my case I just include some static text. Trying to force the save or navigating away from the record also results in the error popping. The nice thing here is you don’t lose your changes when you hit this error. You can’t save until you address the issue and none of the updated fields get updated. But if I remove the change from the Account Name I can then save successfully and the other fields that I was also editing get updated successfully. 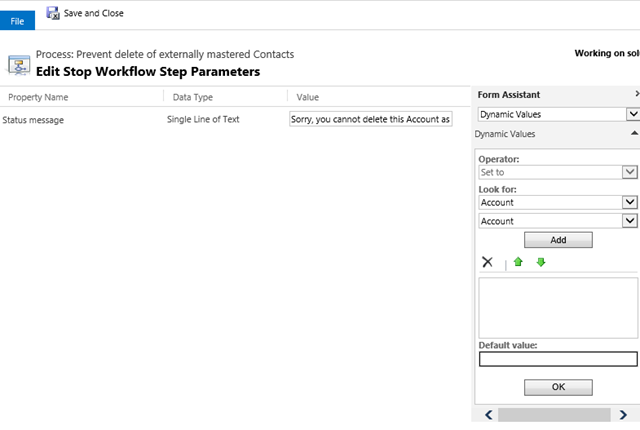 This entry was posted in Uncategorized and tagged CRM 2013, workflow on December 6, 2013 by Gareth Tucker. There are a number of reasons why CRM workflow instances fail to complete. It is important you regularly check for failed workflows to ensure the integrity of your system. Each time a workflow rule is triggered a System Job is created. These jobs carry a status and when a failure is experienced they are stamped with an error code, an error message and are set to a ‘Waiting’ status. Here’s a useful bit of SQL I have been using to analyse a system’s failed workflow instances. It provides a meaningful description for the error codes I have encountered. I put this behind an Excel report so that I can pivot the results and monitor volumes. 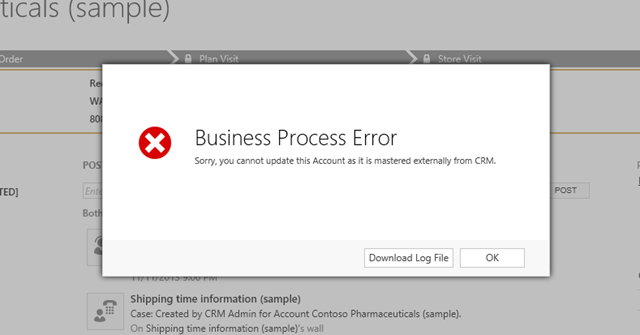 This entry was posted in Uncategorized and tagged 4.0, crm, workflow on April 11, 2010 by Gareth Tucker.